I rarely play Conquest. Last time I remember was Odyssey 2018 when I had to for a Quest and tried Jungle Odin with my small god pool attempting to fill after others chose their roles. I was only about 3 months into playing Smite. It was horrible, so horrible I refuse to play until I reached a bunch of goals I set. According to Guru I played 2 other games this year in Season 5 though I do not remember them. So after last week's patch, my first Hera's Quest is Play a Conquest game and unlike other Quests I avoided it for some time dreading what would happen. Instead I either played other modes or tried to get used to VGS commands needed that I never used in other modes and look up certain things like ward spots, etc. Today I finally dive in because I have 4 more Hera's quests to do after this one before next patch hits. I fill Sobek Solo, got partially lucky and did OK even getting a first blood that I probably would not have if the opposing Bellona Solo had built different. I believe I was the only one even doing Wards and know I still have to work on certain things like VGS commands and farming, I had the worst GPM on my team and I was in lane for quite a while. Still better than I expected. 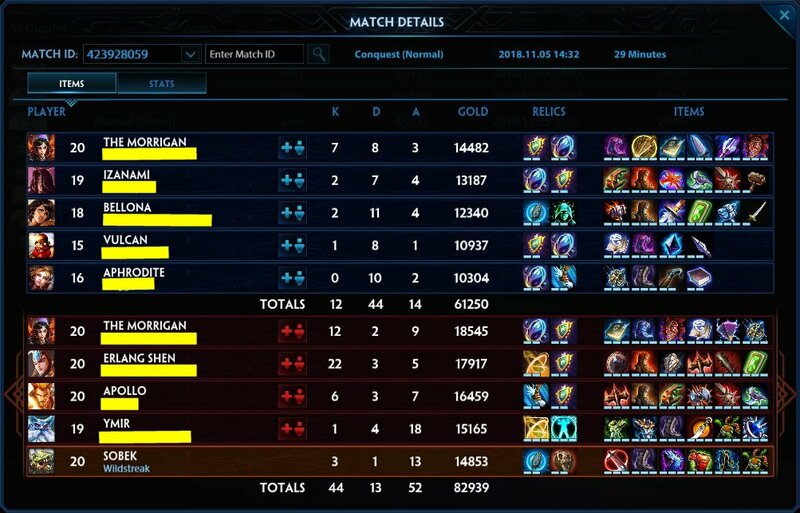 We did get lucky on the Bellona and Aphro Support builds being odd plus I think their Vulcan got salty, went AFK especially since they complained about him after match. Now I have a Play 1 Guardian game quest. Since I figure I have at least 2 out of 5 chances of getting Solo or Support, probably more since Mid, ADC and Jungle are preferred picks, I may have to try more Conquest for this quest and maybe others too including 1 of my 2 weeklys. At least I am in a better spot than last year since achieving most of the set goals I had.